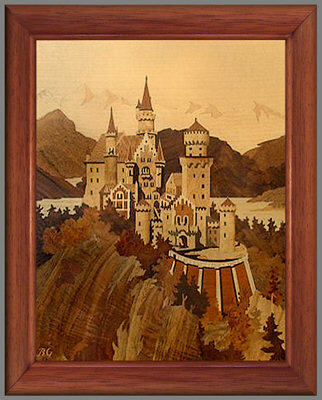 This B & G picture of Neuschwanstein Castle is another variation of the picture you will find on page one of this "Can you help?" section. The 'castle' part of the picture is the same as Bob Boyd's picture, but, this one is shown in a portrait or upright stance, whereas, Bob's is seen as a landscape or horizontal picture. The veneer selection for the surrounding countryside has also been changed for this picture - although the veneers for the castle itself appear to be the same. We can only assume that B & G allowed their marquetry artists some level of their own artisitic interpretations with certain parts of their marquetry designs. 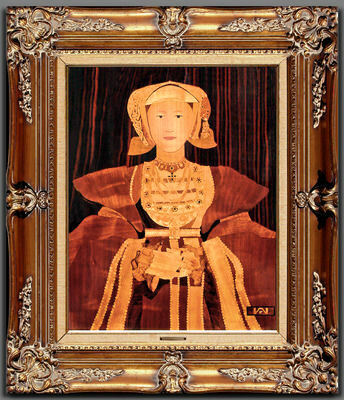 Dan E. owns this superb marquetry version of Holbein's portrait of Henry VIII's fourth wife Anne of Cleves. Dan's marquetry picture was, we think, made by Frank Williams of Colorado, USA. But as to any other information concerning this particular marquetry artist, or this work, this is not to be found in our archives. If anyone knows of Frank Williams or of the history of this well executed (please excuse that unintentional pun) work, would you be so kind as to provide us with a little information about Frank Williams and his marquetry work. Click the above button to return to page 2 of "Can You Help"
Click the above button to visit page 4 of "Can You Help"